With so many beauty products being continuously launched, it is somewhat reassuring to review products from the brands that I already know well. When I know brand’s background & ethos, it becomes interesting to see what they come up with next. 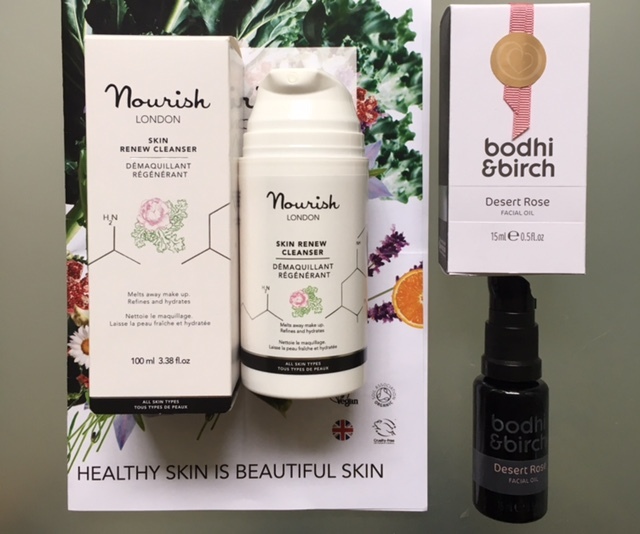 Recently I have been testing a new cleanser from Nourish London & a re-launched face oil from Bodhi & Birch, both are British brands that fall into my favourite ‘natural’ category. Skin Renew Cleanser caught my eye on Nourish stand at the recent Natural & Organic trade show at Excel (the brand recently changed its packaging & I think it works well, keeping brand’s identity, yet making a stronger visual impact). If you don’t know Nourish London, it is a natural, certified organic by Soil Association skincare brand, led by the knowledgable Dr Pauline Hili, who actually prefers her products to have the spotlight, while she & her team work tirelessly in the background. This cleanser was developed to gently, but effectively clear away impurities & make-up from the skin. An omega-rich creamy formula with Argan, Borage & Jojoba, it helps replenish skin lipids, while counteracting negative effects of pollution, making it a good choice for in your evening skincare routine. It also contains Kale ( Dr Hili pioneered use of kale in skincare & started a very popular trend, as now even some nail polishes contain it ) & Griffon extracts, which help protect the skin matrix against pollution & environmental aggressors ( a ‘hot conversation topic’ when it comes to lifestyle & skincare ). Rinsing this cleanser with warm water makes the skin feel clean & refreshed, ready for the rest of your skincare routine. I enjoy using this cleanser, but for me it doesn’t have the same ‘wow’ factor as Kale 3D Cleanse (it is designed to work with water), which makes me feel like a science professor. Having said that it is a natural, effective & reasonably priced alternative to many creamy cleansers already vying for your attention. I deem it worthy of your consideration, especially if you are thinking of switching from mainstream brand, like Liz Earle & her Cleanse & Polish cleanser to a more natural one. You can also use it alongside Kale Exfoliating Cleanser for some regular exfoliating action. A credible contender with a genuine natural ingredient list, delicate scent & thorough cleansing power. • Tocopherol protects skin against pollutants & UV radiation plus Vitamin E is vital for the synthesis of collagen. Full list of Ingredients: Aqua, Rosa damascena (rose) flower water*, Helianthus annuus (sunflower) seed oil*, Glycerin, Cetearyl alcohol, Glyceryl stearate, Cetearyl glucoside, Simmondsia chinensis (jojoba) seed oil*, Argania spinosa (argan) kernel oil*, Brassica oleracea acephala (kale) leaf extract*, Borago officinalis (borage) seed oil*, Rosa canina (rosehip) fruit oil*, Tocopherol, Bisabolol, Griffonia simplicifolia seed (griffonia) extract, Sodium levulinate, Sodium anisate, Leuconostoc/Radish root ferment filtrate, Citric acid, Aloe barbadensis (aloe vera) leaf juice powder*, Olibanum (frankincense) oil*, Zingiber officinale (ginger) root extract, Commiphora myrrha (myrrh) oil, Xanthan Gum, Pelargonium graveolens (geranium) flower oil*, Lactobacillus/dipteryx odorata seed (tonka bean) ferment filtrate, Rosmarinus officinalis (rosemary) leaf oil*, Citronellol, Farnesol, Geraniol, Limonene, Linalool. *Certified organic. Naturally present in essential oils. It has to be said that my review of this product nearly didn’t happen. When Elijah Choo, my friend & founder of Bodhi & Birch, approached me about testing the updated version of this face oil, I honestly told him that I am not a huge fan of roses in my skincare. While I was happy to play with a sample, I didn’t want a full-sized product – having said that, I also don’t review samples, so it was meant to be a simple & short product testing – or so I thought! As soon as I applied this rose-scented face oil on, I just knew that it was VERY special. Elijah managed to improve various aspects of the face oil – the texture is more sophisticated, lighter, yet weighty to the touch, easily gliding over your face, encouraging you to massage it in. It sinks in almost instantly & adds instant glow to the skin. Desert Rose facial oil has the beautiful scent of summer roses in bloom, swaying like dancers in a warm, sunny breeze & it puts a smile on my face as soon as I inhaled its flowery scent. The almost instant dewy plumpness that the oil imparted on my skin made my eyes widen, as I examined my skin in the mirror. Suffice to say that within a few days I was calling Elijah & blushing sheepishly professing my true love for the updated version of this face oil. Luckily for me, Elijah graciously chuckled, but didn’t make fun of my original ‘neigh’. A measure of a very humble man ! Brands often re-formulate their products, not always with the best results, but I think it is always brave to take a popular product & tinker with it, when it already has a loyal following. Elijah takes things in his stride & while I am sure he was a bit nervous prior to re-launch, I know that deep down he was proud of undertaking this challenge that he set up for himself. We often talk about skincare with Elijah & while I don’t come nowhere close to Elijah’s encyclopaedic knowledge of plants & ingredients, I certainly know what I do & don’t like when it comes to skincare products, oils included & I don’t shy away from expressing my opinion. Desert Rose Facial Oil ( formerly known as Desert Rose Rejuvenating Face Oil ) is made with 100% natural botanicals, of which 95% are certified organic. Elijah handcrafts this face oil blend in micro-batches in order to ensure the utmost quality & possibly it is one of the reasons why the oil comes in a 15ml size. When you like a face oil, isn’t it better to have a smaller size, use it & re-purchase a new, fresh one, instead of getting bored of using a large-sized product that goes on forever? I don’t mean to criticise the product sizing in general, as there is a time & need for larger product sizes, especially when you & your skin like it & want value for money, but it brings up an interesting topic of freshness & efficacy up for discussion, much like freshness of the food that we eat. Drawing inspiration from the healing & mesmerising power of nature & traditional botanical remedies, Elijah has spent over a year researching & re-inventing this Artisanal series product. The new formula features an organic blend of Argan, Rose, Prickly Pear (contains the highest levels of betalains of any known plant) & Starflower oils, making this face oil exceptionally rich in Vitamins A & E (consider them your stress-free first aiders for home use! ), as well as Omegas 3,6 & 9, Gamma-Linolenic Acid & Betalains (plant pigments, which are super antioxidants with powerful anti-ageing effect). Plant nutrients in this formula work in unison by nourishing & moisturising the skin, refining its surface & structure, boosting cell regeneration, evening skin tone & diminishing blemishes. One of the things that makes this face oil special for me, a firm non-lover of roses in my skincare, is Elijah’s alchemist talent. With knowledge & precision he blended together Bulgarian Damask Rose Otto sourced from the Valley of Roses with Tunisian Neroli, Somalian Myrrh & Australian Sandalwood Oil, creating a very evocative, mysterious, feminine aromatherapeutic journey. Just the smell of this oil alone gives me an almost instant sense of euphoric rapture, but the oil also fuses together historical traditions & geographical aspects housed within a Biophotonic Violet glass bottle. A journey in time, with multiple aspects & benefits for the individual consumer. The oil works well for normal & dry skin types and particularly well for mature skin. Having said that, it imparts a wonderful glow that women of different ages strongly desire. Elijah managed to change my opinion on a rose-scented product before, when he launched a trio of body oils, Sicilian Rose being one of them. After being on the ‘testers panel’, I was perfectly aligned with another body oil, called Nordic White, but after trying the finalised versions of the body oils (third being Chinois Blue ) my head has been turned. Since then Nordic White has been on equal footing with Sicilian Rose & both have joined the ‘adored beauty product’ rank. The only other rose-scented product that I like is Shay & Blue Amber Rose perfume, which makes me feel very feminine when I spritz myself with it. Elijah now has the honour of being a person who made me change my mind about rose-scented skincare twice! Now, back to my musings about Desert Rose Facial Oil. As I continued to test it, I mentally compared it to other face oils that I used, in terms of texture, scent & efficacy & interestingly enough, found that for me it very clearly comes above Vintner’s Daughter, which is a lovely & very popular face oil, yet whose hype I still fail to understand. Of course we all like or are drawn to different skincare products, but I was genuinely taken aback how strongly I fell under the spell of Desert Rose. It sinks in almost instantly into my skin & I savour its changing scent, as my skin warms up with a facial massage & I become quietly happy. In the morning I wake up to noticeably plumper skin, even if I haven’t drank enough water the day before. All the more the reason that makes me appreciate the skill of a man behind Bodhi & Birch, who toils away in his lab, perfecting the products or creating new ones. After all, when a new product is being launched or an old favourite being re-launched, don’t we genuinely want to be wowed by it, as opposed to it falling short on the marketing promises & us being disappointed in our own gullibility? Organic Argan Oil: Rich in essential fatty acids (80% unsaturated), Argan Oil contains tocopherols (Vitamin E), phenols, carotenes and squalene to help preserve cell integrity and restore skin’s elasticity. It also helps stimulate skin cell renewal, rehydrates dry, damaged skin and effectively reduces wrinkles to help reverse the ageing process. Organic Rosehip Oil: Well known for its outstanding skin regenerative, softening and moisturising properties, Rosehip Oil is proven to decrease signs of premature skin ageing. Its broad spectrum of EFAs and Vitamins are proven to benefit skin against surface blemishes, skin pigmentation and photo-ageing, restoring skin back to its youthful glow. Organic Prickly Pear Oil: Exceptionally rich in Vitamin E (over 88%), Vitamin K and Omega 6, Prickly Pear Oil is shown to nourish and soften skin to restore elasticity. Its high fatty acid content plumps skin, reducing wrinkles and adding firmness, as well as intercepting free radical damage. It also contains the highest levels of Betalains of any known plant. Betalains are super antioxidants with powerful anti-ageing effects. Organic Starflower Oil: Cold-pressed from the seeds of the borage plant, Starflower is the richest natural source of Gamma-Linoleic Acid (GLA). It helps restores skin’s moisture barrier and maintain metabolism, keeping skin strong and healthy. Taking into account past customer feedback, Elijah removed Kukui Nut, Sweet Almond, Wheatgerm and Strawberry Seed oils from the original formula. The new blend includes Prickly Pear and Starflower oils, along with Argan and Rosehip which remains unchanged. The EO is also slightly decreased, so it is a lot brighter. So here you go, two new face care launches from brands that I know & trust & who prefer their products & not the PR department to do their talking.